The parking lot at the Cape Breton Regional Hospital was so full Wednesday that some people were illegally parked and ticketed. Dr. Margaret Fraser described the scene inside the emergency department. For the second time in less than a week, paramedics union president Michael Nickerson sent out a code critical alert. Wednesday morning, there were only three ambulances available to respond to calls in the entire Cape Breton Regional Municipality. At one point last week, that number was zero. Karen Poulin has had to wait during recent trips to the ER in Sydney. “I've tried to use ER services here many times and I’ve waited up to 13, 14, 16 hours,” Poulin said. She now makes the five-hour trip to Halifax to see her family doctor. 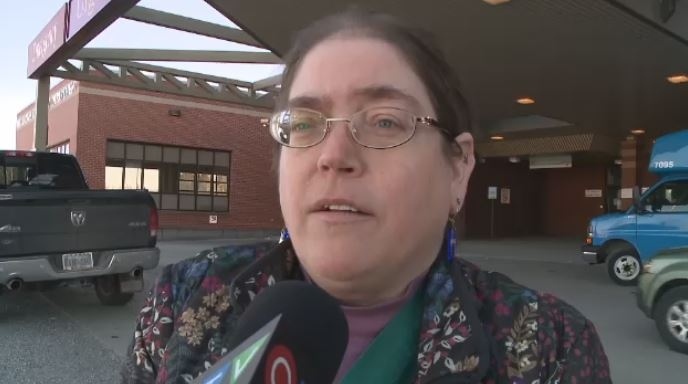 The state of health care in Cape Breton has prompted outrage from the community. A protest is planned for outside the hospital Thursday morning at 11 a.m.
Fraser says she supports the rally, but thinks it's highly unlikely much will change. Fraser has sometimes worked on her off days to meet the demand at the hospital since ER departments at others in Cape Breton were closed. “I'm exhausted, for a variety of reasons. But yeah, I'm exhausted,” Fraser said. The code critical for ambulances was lifted Wednesday afternoon. Michael Nickerson from the paramedics union says there have been 256 code criticals across the province since they started tracking low ambulance numbers about a year ago. Dr. Margaret Fraser, an emergency room physician, is sounding the alarm on the lack of resources at the Cape Breton Regional Hospital.